This is another dish that came out of the collaboration with Teun and Albert. I wanted Teun to try octopus sous-vide, and I remember how much I liked the char-grilled octopus at La Madia in Sicily. Although we ended up doing something different, our original idea was to do something along the lines of the octopus dish from La Madia. That dish featured a rock. Due to timing constraints (and also because the rock at La Madia wasn’t very tasty even though it looked great), we decided to go for a soft octopus sponge cake instead. Recently, Paul of That Other Cooking Blog wrote about a microwave brioche. This is a trick that was originally devised by Ferran Adrià of El Bulli. 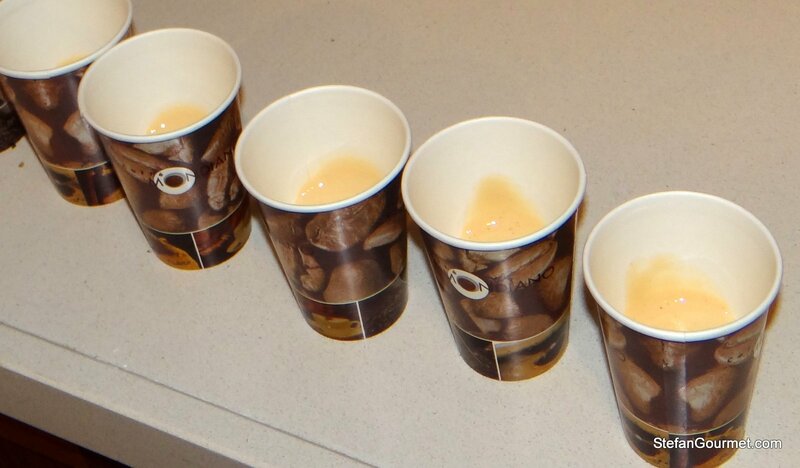 A batter with a lot of eggs is siphoned into paper cups with nitrous oxide and then cooked for 30 seconds in a microwave oven to get a sponge cake. As octopus leaks a lot of juices when cooked, we thought it would be nice to reduce those juices to a thick octopus syrup and use that to flavor a sponge. We thought it would pair well with a bell pepper coulis, and when we realised our menu needed more vegetables we also included some oven-roasted romanesco (green cauliflower). The resulting dish had great flavor with multiple layers. Charcoal grilling gave the octopus a very nice flavor and all the components paired very well with each other. The plating did not turn out as nice as we had hoped. Next time we will have to make the sponges bigger and perhaps we can try to make more of a rock by putting the sponges in a dehydrator. 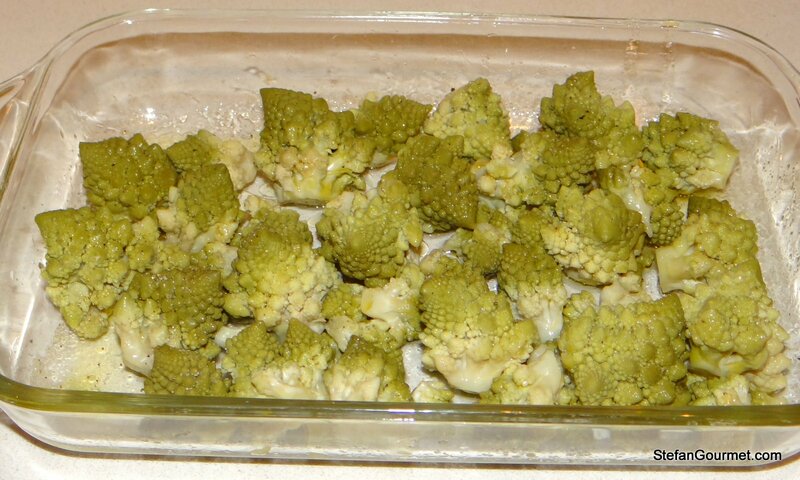 We parcooked the romanesco sous-vide, which is good for the flavor but it did lose some of the green color. The red of the bell peppers also didn’t work very well with the pink/purple of the octopus. So the flavor was outstanding, but, although the photo doesn’t do it justice, we will improve the plating. Here’s what we did. Remove the eyes and the beak of the octopus. Cut off the arms. 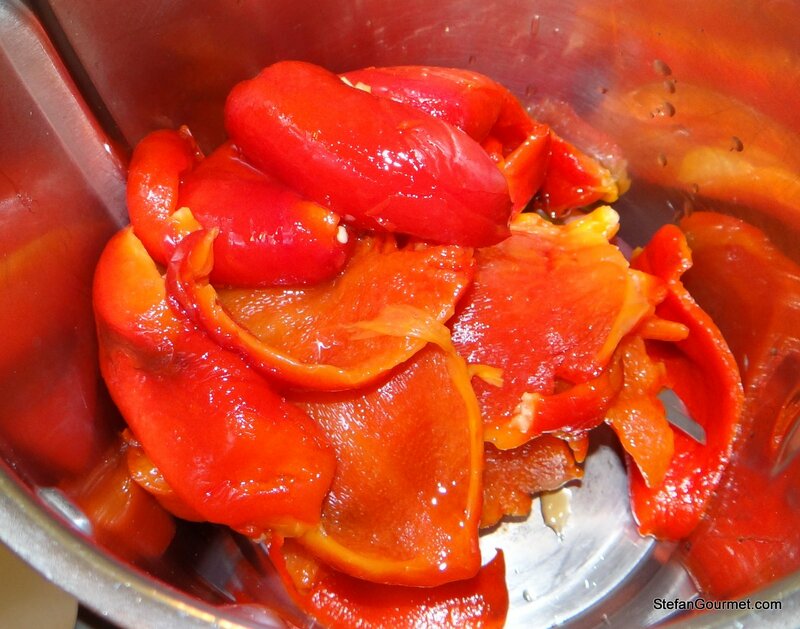 Roast the bell peppers in the oven at 250C/480F for 25 minutes. Let them cool in a closed plastic bag. Remove the skin and the seeds. Whiz the bel peppers in the blender. 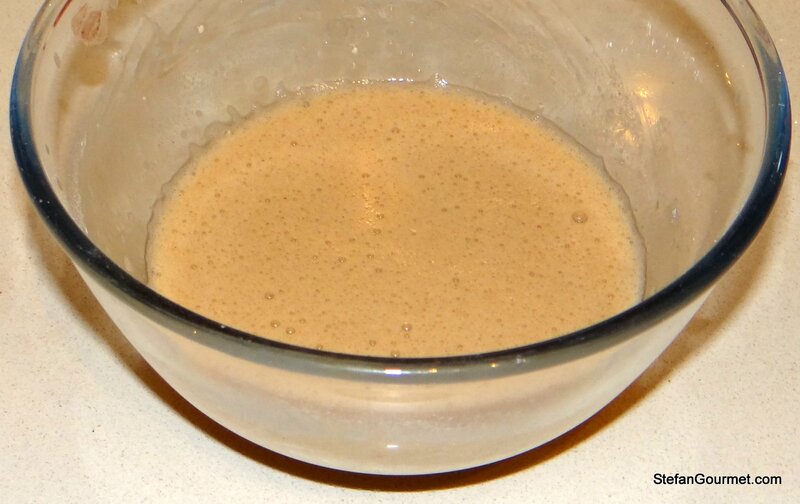 Add salt, black pepper, red wine vinegar and/or balsamic vinegar, and sugar to taste. 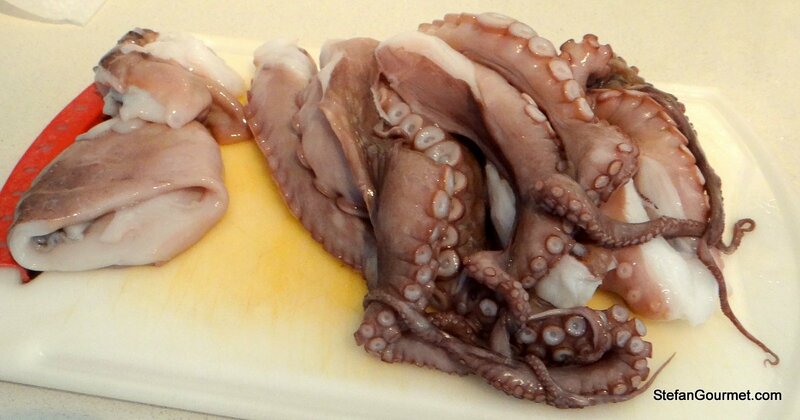 Once the octopus is cooked, collect the juices. 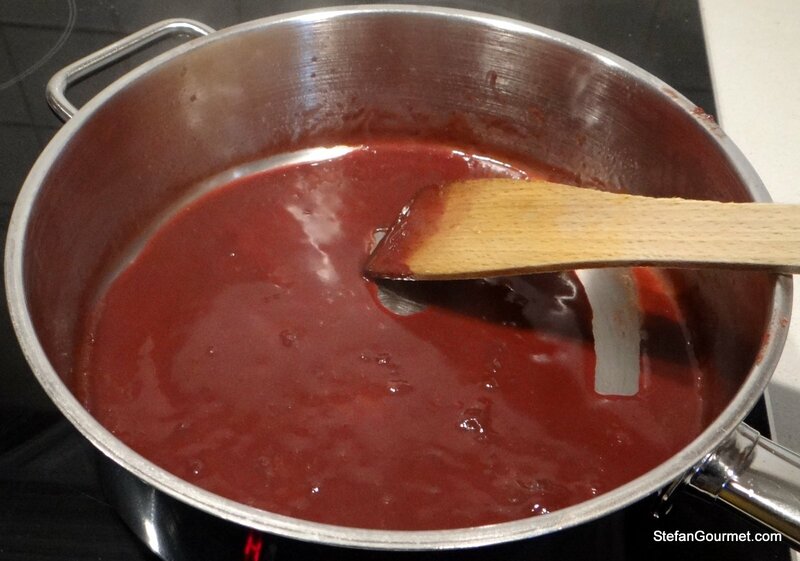 Put the juices in a wide shallow pan and reduce them over medium heat, stirring on a regular basis, until very thick and syrupy. 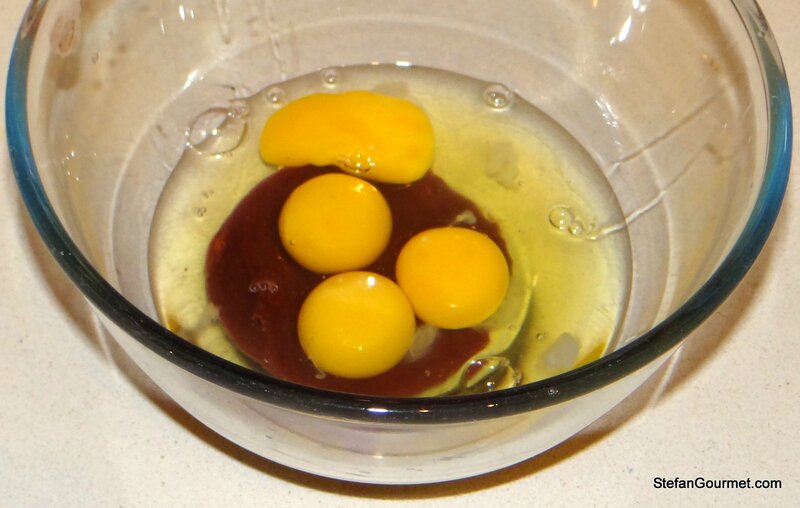 Combine the eggs with about 3 Tbsp of the octopus syrup. Whisk to mix. Then whisk in the flour. Add 1/2 tsp of sugar and a few drops of lemon juice. 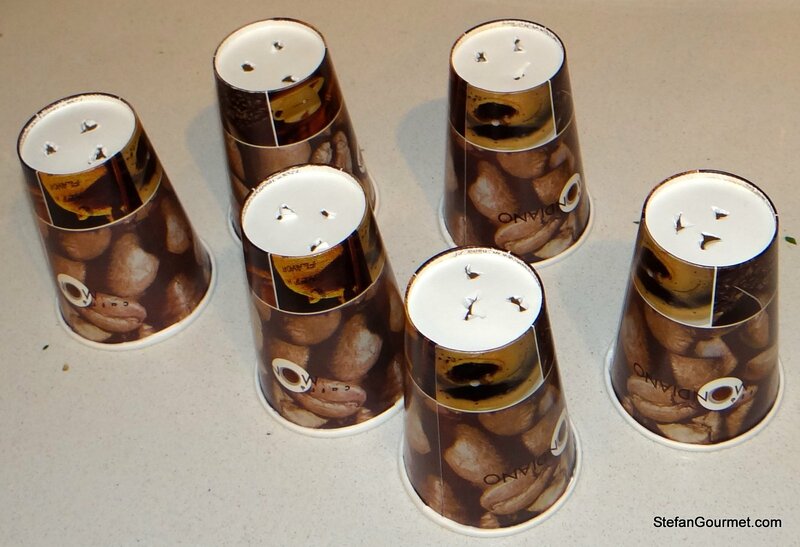 Prepare the paper cups by making 3 holes in the bottom of each cup. Fill the whip with the batter and charge it with nitrous oxide. 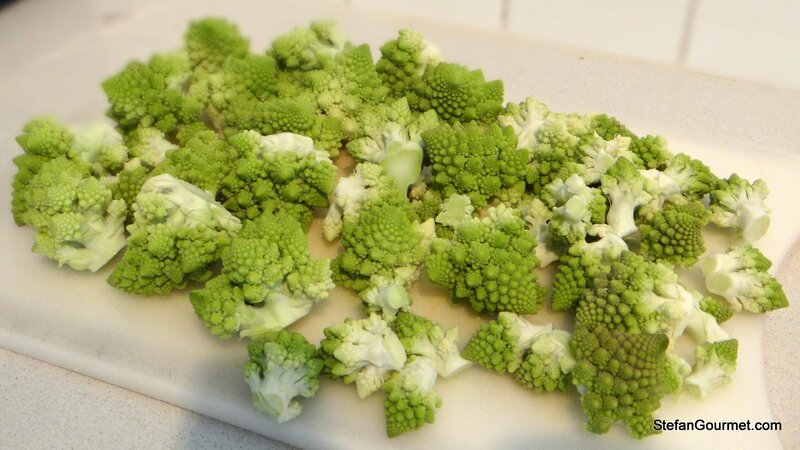 Once the romanesco is cooked, toss with olive oil and roast in the oven for 15 minutes at 225C/440F. 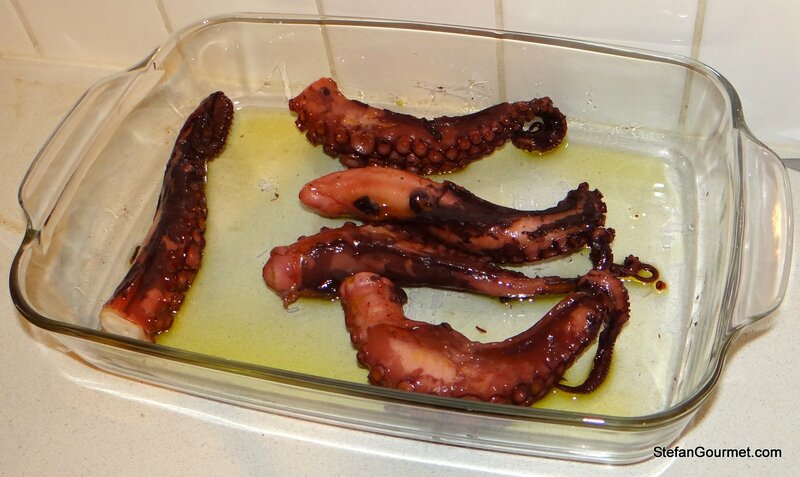 Toss the octopus legs with olive oil. Grill the octopus legs on a very hot charcoal grill. Turn them quickly as they should not burn and remember that they are already cooked. 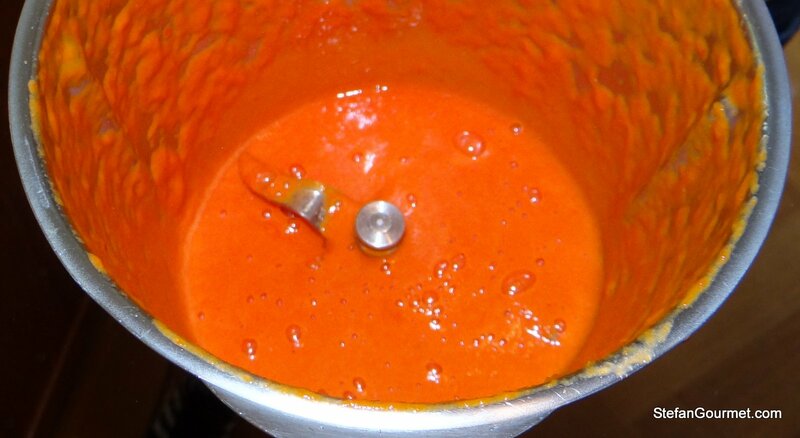 Reheat the bell pepper coulis (in the microwave). 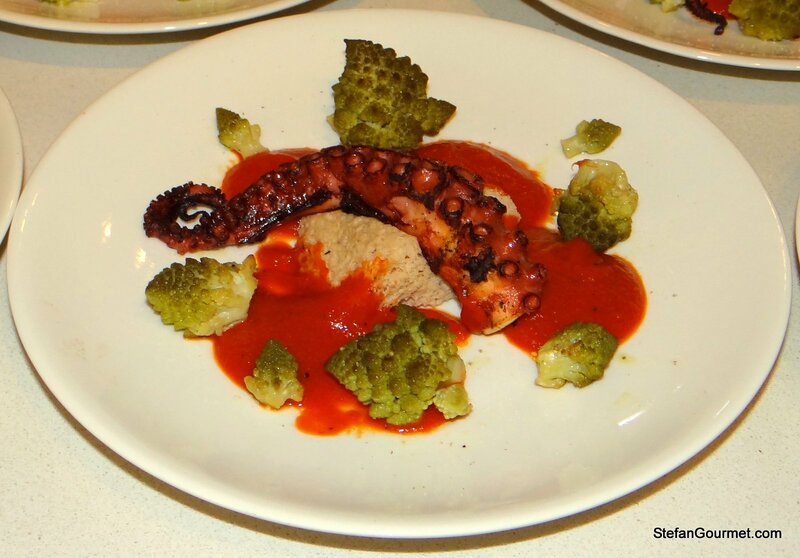 Arrange a ‘sea’ of bell pepper coulis on each warm plate with an octopus ‘rock’ and an octopus arm in the middle, and some green romanesco rooks around it. 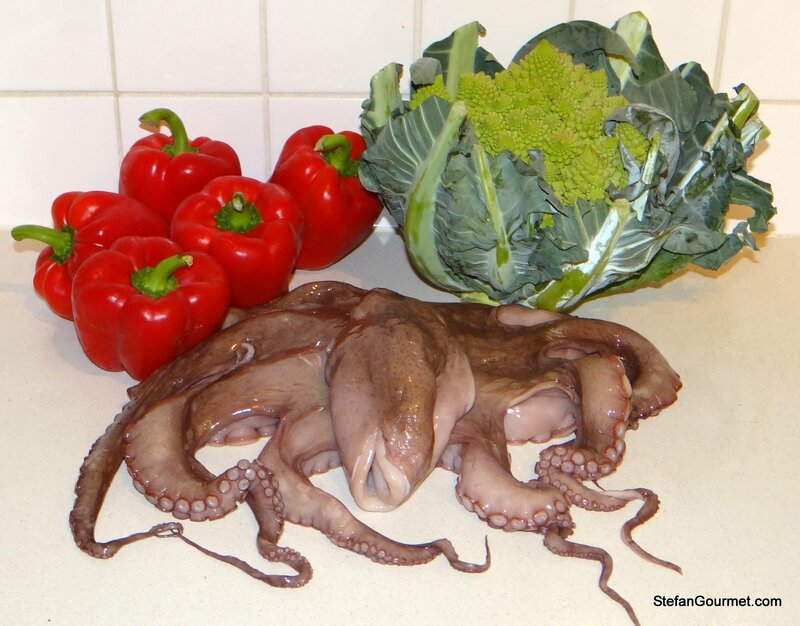 Sprinkle the octopus with a few drops of lemon juice before serving. This dish has strong multi-layered flavors, so you need a dry white wine that can hold its own against that. We enjoyed it with a pinot bianco from Alto Adige. The octopus has a lovely colour to it once it’s grilled. I’ll have to try that as I’ve only had octopus on a sushi plate. 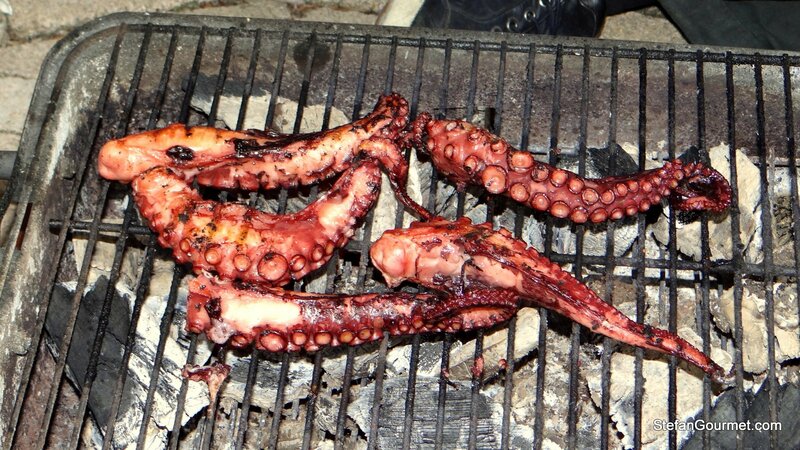 Grilled octopus! that is so delicious. Wish I had a charcoal grill, think Ive gone over why I don’t, building code basically. Love the idea of flavoring the sponges, I need to try that. If you want the sponges a little tougher, you can always give them a few more secs in the MW, eventually they dehydrate entirely and become pretty hard like stale bread. I tried that, and cut them in cubes and then tossed them on a skillet with some olive oil and made “croutons” that way 🙂 Your red bell pepper coulis pairing sounds pretty great btw. And thank you for the mention, Stefan! Thanks for the tip, Paul, I’ll have to try that! Hi John! 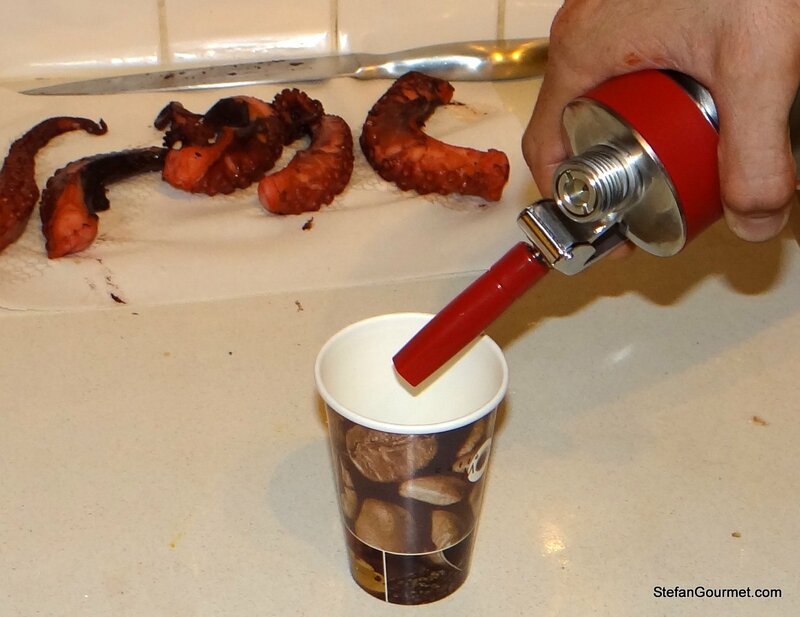 I think getting it right without using sous-vide is very difficult — octopus becomes tough real easy. What you could do is this: put the octopus in a ziploc bag, submerge it and then close the bag with as little air as possible (water deplacement method). 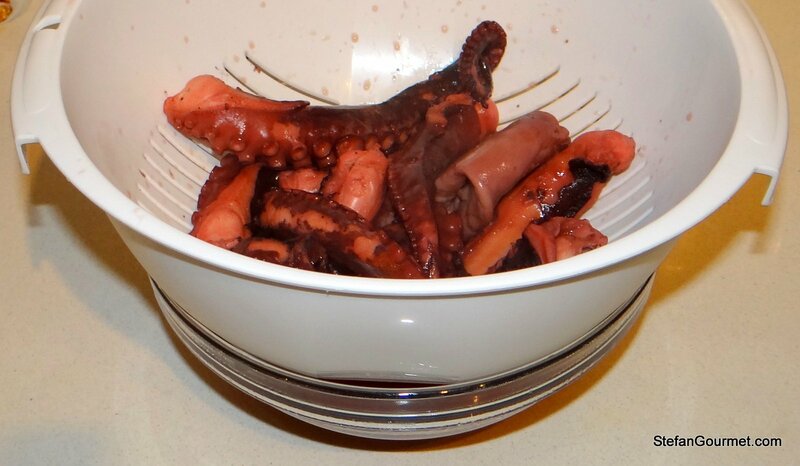 Put the bagged octopus in water that is about 185 degrees for 3 hours. It is okay if the temperature moves between 180 and 190 or so. Of course you can always cook it the traditional way “in umido” — would love to see a post about that! Lovely again Stefan. You are getting very diverse in your cooking methods. Nitrous Oxide! Oh the fun of scheduled posts 🙂 The stuff we’re eating at the moment is quite a bit more simple.